Have you ever wanted to get a really deep look inside your pipes when searching for a clog? Ever wished that your at-home snake solution had a camera at the end? What you’re describing is a sewer camera inspection. This high-end, sophisticated service is offered by our company, NuFlow. It can be hard to appropriately solve a problem when you don’t know exactly what the problem is. This is the problem plumbers run into when using traditional inspection methods like digging or using the snake to remove a small clog. With sewer camera inspections, you don’t ever have to worry about not knowing the problem. We offer them as preventative maintenance, since it helps us know a problem before a problem even happens. For example, if we see wear and tear on one place of your pipe, we’ll go ahead and suggest that we seal that joint or area. That prevents a leak from happening and effectively removes the problem. It may seem silly to take preventative measures on pipes, but they often show signs of stress before the problem erupts into a 3 a.m. emergency when your toilet won’t flush and your tub is making that horrible gurgling noise. Well, that’s why we offer preventative services. We see that problem coming and solve it. This can save you thousands and possibly tens of thousands of dollars. How Do I Save Money with Maintenance Like Sewer Camera Inspections? If you have that 3 a.m. emergency, you’re most likely looking at upwards of $10,000 in repairs for your pipes and your destroyed property that was mangled in the process of repairing your piping. Issues like these can be stopped before happening with sewer camera inspections. We see that emergency happening. Not only that, but if you’re looking at potentially buying a home, a sewer camera inspection is an absolute must. How much would you hate to be moved into your home for a week and a half and then move right back out because sewer waste is all over your living-room floor? The same floor covered in thousands of dollars of important things like books, photos, or even clothes and furniture. 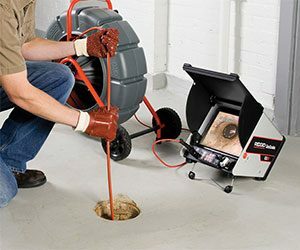 With sewer camera inspection, you don’t have to worry about those things. If you find a problem in your pipes, you can ask for a lowered price in the house because of the cost of fixing those pipes. That’s a great thing. There are plenty of great plumbing services out there, but none compare to us. We were founded in 1998 and have gone on to pursue bigger, better jobs. We service industrial, commercial, and residential areas. Your home is no less important than the large buildings we service everyday. Our plumbers are understanding of frustrations and work calmly and patiently with customers just like you to find the best solution. We always offer prices we think will be the best for you, and we don’t misdiagnose problems using sewer camera inspections. So call us today for your sewer camera inspection, and save some money.